Food prices are growing like pole beans, and many people are planting more edibles in their garden, or taking up gardening for the first time, in an effort to save money. So, I thought a blog post on the subject would be both timely and useful. First, why are food prices going up? Two reasons, oil and ethanol. Oil prices reached $130 a barrel today on the back of demand from developing countries, weakening supply, and speculation. Everything that is transported by truck has mirrored oil in price increases. It costs more to transport the food from the farm to the market, it costs more to farm the food because tractors run on gas, and so the food goes up in price. The second reason is a woefully misguided ethanol policy pushed on us by Democrats and most Republicans in Washington, and this is such an important issue I am going to talk about it a little. From President Bush to Hillary Clinton to Barack Obama, most politicians have caved to big agribusiness lobbying and supported corn ethanol mandates and subsidies. Only a few people such as Kay Bailey Hutchison (R-Texas) and of course John McCain have been vocal against it, going way back. McCain to the point of ceding the Iowa Primary to his competitors rather than pander to big agribusiness. Even if you disagree with his other policy positions, you have to give him props for being the only presidential hopeful from either party to go to Iowa and say that he doesn’t support corn ethanol subsidies and mandates. The problem with corn based ethanol is that it is a waste of time, money, and increases food prices. Seriously. Consumer Reports did a comparison with one of those flex fuel cars that can take gasoline or E85 Ethanol. Since ethanol has less potential energy than gasoline they got fewer miles per gallon with it. To the point of about 30%. So, 10 gallons of gasoline will get you 30% farther than 10 gallons of E85. Or, with E85, you use 30% more fuel to go the same distance. Then, corn is an extremely labor intensive and resource intensive crop to grow. With high fertilizer needs and complex machinery you only get about 1.3 gallons of ethanol for every 1 gallon of gas spent harvesting it. So combine the two issues together and you’ve got about 0 in fuel savings. So we’re spending all this money on subsidies and having a government mandate that doesn’t actually result in better, cheaper, or cleaner fuel. But, what we are getting, is more demand for fertilizer, which increases the price of fertilizer, more demand for arable land, which increases the price of arable land, and more demand among the land for ethanol corn plantings, which increases the premium other plantings (ie food) need to achieve, and all of that results in higher food prices. The really scary thing, none of this is recent news. I was reading articles on ethanol’s problems as a “solution” back in 05. I wish congress had read the same ones. Also, I don’t mean to say all ethanol, ethanol made from switchgrass for instance (which grows like a weed) gets something like 5-8 gallons for every gallon spent, much, much, better than 1.3 from corn, and yet we’ve got this corn mandate. Fishy? You bet. So write your representatives in Washington and tell them to kick the corn ethanol habit. In the meantime, back to gardening, so you want to plant food to save money, good idea, even people with small yards can plant enough to save a few hundred dollars a year at the grocery store, and with medium yards you can easily put that into 4 figures at current ridiculous prices (oh yes, this week I spent $2 for a single zucchini). When evaluating what plants to grow for money savings you need to consider a few different issues. How easy is the plant to grow? How much does the food you get from the plant cost at the store? How well does the food product keep? How much of the food can your family eat? How much space do the plant needs? Do you get significantly better quality when growing it yourself? And finally, what grows best in your area? How easy is the plant to grow? Time is money, water is money, fertilizer is money. If you’re gardening as a hobby some of these things do not matter, but if you expect to save money by gardening they do, and so how easy a plant is to grow matters. This includes planting, harvesting, watering, fertilizing, soil requirements, etc. How much does it cost at the store? This should be obvious, you get better value growing more expensive things. If you have a 10 sq/ft plot and can grow two plants that will yield say 20 pounds total, then it is better to grow the plant that costs $3 per pound at the store than the plant that costs $2 per. How well does the food keep? Foods that go bad quickly require expedited shipping to reach the market, which is more expensive, so they tend to be priced at a premium at the store. On the other hand, if the food goes bad quickly it may be hard for your family to eat it all when the harvest comes due, so consider that when deciding how much of a food to plant. How much can your family eat? This ties into the previous one. There is no point planting an acre of eggplants if your family doesn’t eat them or can’t eat that many. When you buy a packet of seeds and there are 100 seeds in there, it doesn’t mean you need to plant all 100, plant 2 or 3 and save the rest for the next year, that way you’ll have the room to plant a larger variety of plants. How much space do the plants need? We don’t all have full fields in our backyards, when you’re limited on room veggies that can be planted densely will tend to provide a greater value than those that need more space. Do you get better quality when growing at home? Many plants are picked before fully ripe to be sent to the store, and so they never get as sweet as they can be. Or, some plants once picked instantly start converting sugars to starch, and so are never as sweet at the market as they are when just picked. This isn’t really a money saving issue, but can factor into your decision of what to plant. Hot peppers are expensive at the store, but I wouldn’t think of planting them up here in Michigan, they need hot weather to grow and we don’t have a lot of it. If I plant something that tolerates cooler temperatures I could get two, maybe even 3, harvests in a year. Many veggies you can harvest after 50 or 60 days, so if April and September are warm I could get 3 plantings in. Likewise, a plant that requires lots of water shouldn’t be planted in the southwest as you’ll be spending to water it throughout the year. My favorite money saving plant is raspberries. Raspberries are expensive at the store because they do not keep or ship well. They produce for months and months all summer, and keep producing until October usually for me. My 4×8 mature raspberry patch probably makes me around $5 a day during the peak of the summer in free fruit. They are perennial bushes so you only need to plant them once and they will grow forever. They also spread like mad so if you want them to cover a larger area you can buy fewer plants originally. Berries are also extremely good for you, high in antioxidants and vitamins, fiber, etc. If you have too many, you can easily make jam and can them, once canned they’ll keep for a year. Raspberries handle drought, poor soils, do not need fertilizer, and produce tons of fruit. Blueberries have very particular growing requirements. Strawberries, because of their short stature, do not give you as much food per sq/ft. Raspberries are the superior berry for the home garden. Another favorite of mine is asparagus. Asparagus is one of the very few perennial vegetables, plant it once and harvest it for decades, so it doesn’t require a lot of time commitment. It is also fairly expensive at the store, and it is one of those that is best when first picked, because once it is picked it starts converting sugars into starch and fiber. Corn is also best when first picked for the same reason. However corn does take more work, and space, and fertilizer, and so isn’t going to be a good choice for everyone (but if you have the room, maybe give it a try). Any food you can get from a tree is going to end up being cheap in the long run, if you can be patient. $20 for a tree now and in 5 years you may start getting some food from it, in 10-20 years you’ll be feeding yourself and all your neighbors, but that is long term. Nuts of all types are of course expensive at the store, and most of the country can grow walnuts and pecans, but fruit too can be a good option. Dwarf apple, pear, or cherry trees can fit in even the smallest yards, and letting those fruits ripen on the tree makes them very sweet. Leafy green veggies such as chard or mesclun mixes can be good to grow. They don’t keep well so they’re expensive at the store, they can be grown in cooler in weather, and they can be harvested repeatedly. When you want a salad, you go out and cut enough just for that salad, the leaves grow back, and the next time you want a salad, you have more to harvest. Onions can be a great crop to grow for a few reasons. The big ones are now around $2 each at the store, whereas you can buy a bag of 100 onion sets for $2. So, plant them all, and you’ll make around $200, not bad. Onions, being bulbs, can handle cold weather, you can get them started early in the year, or plant them later. Onions, also because they’re bulbs can be planted close together, 4-6 inches apart. You can literally tuck them in any free nooks in your garden. You can also grow them in containers. Right now I’ve got 4 or 6 big pots full of onions because it is still too early to plant annuals or other tender plants in them, but I’ll be harvesting those onions in June at which point I will be able to plant something else in those places. My final pick is hard squash, butternut or spaghetti. I used to hate squash, but all I knew of it was some horrid dishes passed at a relative’s thanksgiving. After learning different recipes, ways to prepare it, spices that compliment it, I like it. Squash does take a bit of room, but you can’t beat the storage. Keep it in a cool, dry, and dark place and hard squashes will keep for a year, I’ve even heard of longer than that. They’re also very healthy, high in beta carotene and fiber. So there is no worry about being stuck with a huge harvest you cannot eat, that one harvest can be eaten over the course of a year. My final tip to the home gardener looking to save money by growing their own food is to make use of succession planting. This means planting in stages, over the course of weeks, so that you’re also able to harvest in stages, over the course of weeks. By making sure all your food doesn’t need to be harvested at the same time you make it easier to ensure that you have time to eat it all when it is ready to be harvested. Your are so right with the issue of ethanol. I don’t understand why people don’t get it. To me it’s common sense. I’m growing more in my garden this year. I’m fairly “new” at the veggie gardening but the last two years I have had great success. This year I’m trying more. GREAT POST! With the price of fuels steadily increasing (we’re paying a few cents under $6/gal here in NS, Canada), we’re all going to HAVE to start growing our own. It wouldn’t be a bad thing if you have a place to garden. The price of everything is going to go through the roof as trucking costs, especially, increase. Sigh. You have many great tips here. I just did a post today on our work putting in raised veggie beds. This will be my first vegetable garden so I’m excited but also a bit nervous 🙂 Glad to see your high recommendation for rasberries as we’re planning to buy some canes this year! Very good article! It took me a few years to learn how much of what grew and how much I could use. I think my first year of gardening I had so many cucumbers we had them growing out our ears and there were so many tomatoes waisted we just couldn’t eat enough and keep them picked. This year I have cut back on both those things and planted more carrots and green beans cause that is something we didn’t get enough of. Great post. It’s very clear and very helpful. Hi, I am a gardening nut and I just came across your blog. Very helpful articles! You are so right, I blame media conditioning and social mindsets for people thinking they can’t do this. Also I would suggest growing garlic, it has great medicinal qualities and is very easy to go. Need cool climate. Also for people with little space, why not try hanging baskets. They are great and save bending down some much and they don’t get so many weeds, or voluntary plants (I love that expression). 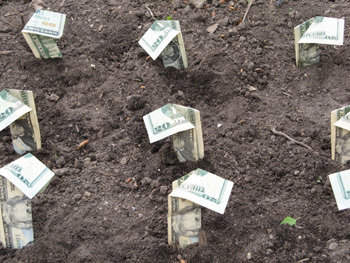 If only we could all grow a garden that sprouted money!!! I have grown my own veg for years and it saves me a fortune especially with todays prices. Away from the money aspect the actual taste and joy of growing your own organic food is great. Now how on earth will we ever get the purple carrot back? Very interesting blog. I heard somewhere that the cost of groceries has gone up 100% in the past year; at least here in Canada. We will need to find more and more areas to grow our own food, especially if we are in confined living such as apartments or have tiny lots. I know there are ways to grow a garden almost anywhere (small greenhouses, tire gardens, hanging gardens)… if there is a way to grow our food we need to find it to avoid the high cost of living. We got started just as a hobby but now appreciate the savings compared to having to buy it at the grocer. Some things you can’t find there as well and that is an added plus. So far this year we have harvested around 35 pounds of onions from the winter, several dozen cloves of garlic, enough peppers to pickle 8 jars of jalapenos, 10 pounds of roma tomatoes from the first round of plants, countless eggplants. All from a 1/10th acre garden in an urban setting. if we all did it we WOULD change the world. Great tips here, will forward to my mom. I’ve designed an above ground system and will release how to build yourself, but is anyone really interested in growing anove ground? This country has always had a cheap food policy. Not that the farmers cleans up as evidenced by fewer family farms, more large volume oriented production platforms. You can not beat local food supporting local growers, producers. I grew up on a Maine potato farm. The work ethic farm kids acquire is worth the price of admission alone. Hi I just wanna spread the word that I wanted to start growing vegeies so I went to my local family dollar and bought seeds for $0.25cents a packet of any seed so 4 packets for a $1.00 also they have plastic window flower pots you know the long ones for $1.00 and a nice size bag of all purpose planting soil for $1.00.